The infamous Black Widow case shocked New Zealand. An average-looking suburban housewife carefully staged her husband's 'suicide'. At first it looked like she might get away with murder, but then her sister-in-law, Lee-Anne Cartier, became suspicious and started gathering evidence and presenting it to the police. Unfortunately they didn't believe it was enough to get a conviction and signed the death off as suicide. Lee-Anne then drove the case at the inquest and a finding of 'No proof of suicide' was pivotal in getting the police to reopen the case. 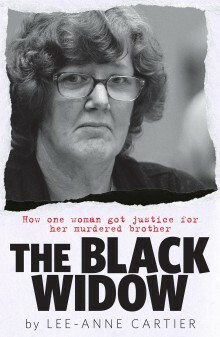 This is a story that reads like something out of a movie script, but was all-too-horribly true, THE BLACK WIDOW goes behind the headlines and gives readers a much fuller story behind one of New Zealand's most infamous modern murder trials, that of Helen Milner. Milner was married to truck driver Phil Nesbit, who died in 2009. The police thought it was a suicide, but Phil's sister Lee-Anne had doubts, and grew to believe that Helen may have murdered him. It wasn't an easy road to change minds, and THE BLACK WIDOW outlines the long, twisting struggle Lee-Anne had over more than two years, conducting her own covert amateur investigation, to find some measure of justice for her brother. It's a compelling story; Lee-Anne was a high-school drop-out with no expertise who showed Erin Brokovich-like levels of determination and resilience, even as so many people doubted, and had to put herself and family into debt to keep on going. THE BLACK WIDOW is a compelling read about a heroic woman who put so much of herself on the line to try to right a wrong. There could be a danger in someone like that, sharing their story in book form, as coming across as trying to 'toot their own horn' (as my Mother would say) or point out how they were right and the police and 'experts' were wrong, all along. But THE BLACK WIDOW doesn't read like that. It's just Lee-Anne sharing her story so that readers understand what actually happened to her brother, and the battle that she and her family went through to prove it. This is a very readable, very interesting story that flows along well. It's told in fairly straightforward fashion, without the literary flourishes of some true crime writing, but also without the garish or voyeuristic elements of others in the genre. It gives us an in-depth look at a victim/victim's family perspective on the machinations of the criminal justice system, which is eye-opening, valuable, and at times troubling. Lee-Anne shares things in a candid way, which is great for readers. A book that's not going to blow you away stylistically, THE BLACK WIDOW is a tale well worth reading, especially for the underlying story of a determined and brave woman battling for justice.